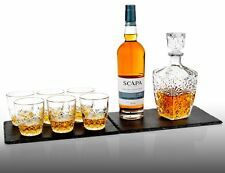 Complete with 2 Italian Crystal Whisky Glasses, a set of 8 Polished Whisky Stones, Stainless Steel ice tongs and a handy velvet storage pouch, it is presented in a stunning hand made wooden gift box. Queensway Whiskey Tumblers . Sports & Exercise. Set Includes 6 Matching Glasses. Gift Boxed. 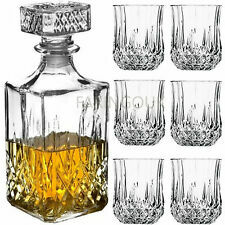 Made from high-quality glass with a beautiful floral design these glasses are perfect for any spirits. Tumblers: 6 x 200ML. The six glasses allow you and your guests to enjoy a refreshing drink. Keep your drinks looking nice too! Pour your favourite beverages from ice cold juice to a cheeky cocktail into these versatile glasses. Never get confused with which glass is yours with each tumbler having its own unique colour. Solid, versatile and functional - these glasses are a sure winner in any table-setting! Beautiful diamond shaped tumblers. Oozing style with ease, and fitting in the palm of your hand perfectly, roll around your whiskey then place on one of the diamonds 8 sides, holding the liquid beautifully at an amazing angle, ready to reach and sip. 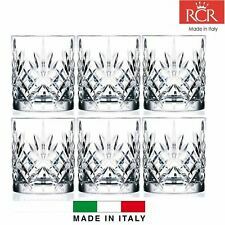 RCR Adagio Set of 6 Crystal Tumblers Whisky Glasses. 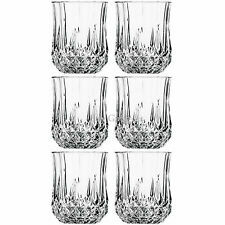 Stunning Crystal Tumblers. This collection will add sparkle to your room. Will enhance any table. Crystal Clear Glass. Height approx. Holds 35cl. Luxion is the superior lead-freecrystal glass patented by RCR. 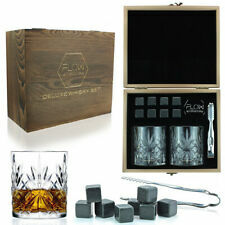 Set 4 RCR Mixology Luxion lead free crystal glasses. A different etching design on each glass. Each glass has a capacity of approx. ISLE OF MAN. Finally, a way to enjoy cocktails and drinks in style! This set of Arizon Design Glasses is a comprehensive collection of different sized High Quality Glasses, each on suitable for a different purpose. Made by Durobor. 2 x 33cl short tumbler. The small 19.2cl Tumblers are suitable for enjoying a nice smooth and aged Whiskey, whereas the tall 32cl is perfect for the classic Higballer Cocktails such as Mojitos and Rum & Coke. 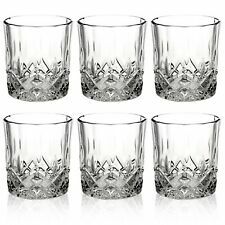 Comprehensive 18 Piece Set of Glasses - 3 x 6 Styles. 2 x 33cl Short Tumblers. 2 x 33cl short tumblers. Set of thirty three centilitre short tumblers. Made by Durabor as part of their Quartz Old Fashioned range of glassware. Durabor creates contemporary high quality dishwasher safe glassware. Checkout our new iridescent shot glasses gin glasses and our range of iridescent kitchen tools. The set of two balloon style glass tumblers are finished with an iridescent lustre finish, which gives you that rainbow sheen that is so on-trend. About the Glencairn Official Whisky Glass. Lead Free Crystal, Machine Made, Dishwasher Safe.